When I went to the yarn store the other day the woman was shocked to hear that I had been knitting for over 20 years. It is true, just not on a regular basis (thus the reason I had to relearn some things). I originally learned how to knit when I was in elementary school. 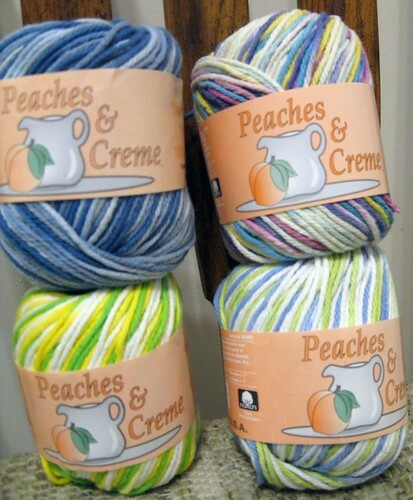 Most summers when I was in school, my friend across the street and I would knit together to pass time at night when it was too warm or buggy to sit outside. She would always do small projects or more complicated items since her mother knew how to knit and could assist her. Her mother used to make gorgeous sweaters and other amazing things. Anyway, one year I decided I wanted to knit an afghan. I believe I started this either at the end of high school or when I was in college. I figured I would do it like the blankets that my grandmother and aunt make. This would mean knitting three super long strips and connecting them at the end. Last night while at my parent’s house I went to my old room and opened up my craft bin. Inside I found that old project. 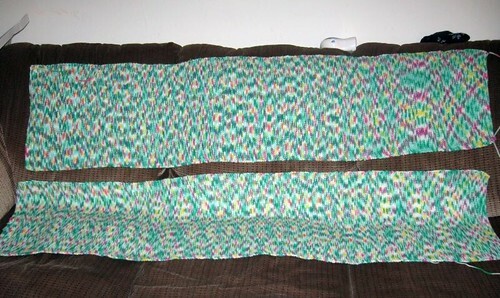 Those are the two finished strips. In addition to this, I found more. Still on the needles was another strip that is probably half done. Eventually I want to finish this since I put a lot of hard work into it. I am going to talk to my Aunt T to see if she can help me to piece it together once I finish the last strip (between other projects – while relearning how to purl). 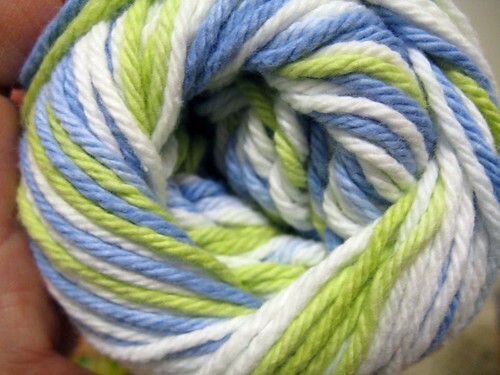 Earlier Saturday, Laura told me to get some cotton yarn at the store. She thought it would be a good idea to make some wash cloths to practice casting on, purling, and binding-off. Ya know, make smaller projects that one can finish once the scarf for JSL is done (which it practically is). The reason is I do not want to use the nice new yarn for my scarf to practice on. Since the yarn was really inexpensive (and I can use the practice), I thought it would be fun for all of us to pick a color for me to make. JL and NHL were both game too. 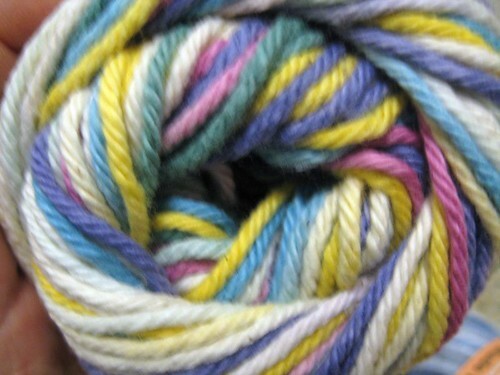 I selected a yarn that was colorful, not too bold and made me know that I am the Estrogen queen in this house! It is called Potpourri. JL selected a masculine mix of blues. It is called Faded Denim. Then it was NHL’s turn to pick. Well, it speaks for itself. *sigh* *shudders* This is called Lemon-Lime, but I believe I will have more colorful names for this soon. Right after his own selection, NHL picked one for his little brother (thank goodness there were none with orange). 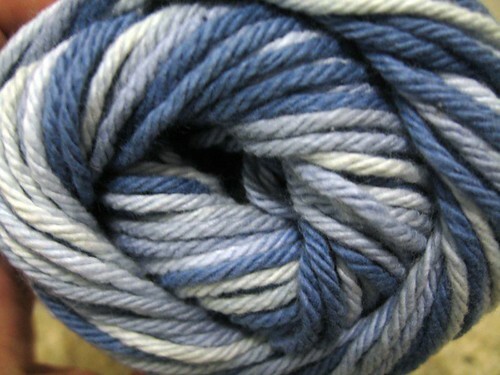 This one is called Sea Mist. So to recap these are the yarns that were purchased for me to relearn how to do all things knitty. A special thanks to Laura for agreeing to help me with this and suggesting the cool new mini-projects. Now can someone please buy me some shades for when I tackle the one for NHL. . . ugh! « He’s on his feet – ACK! I can (I think still lol) crochet. I learned when I was about 7 or 8. But, I have always wanted to learn to knit. 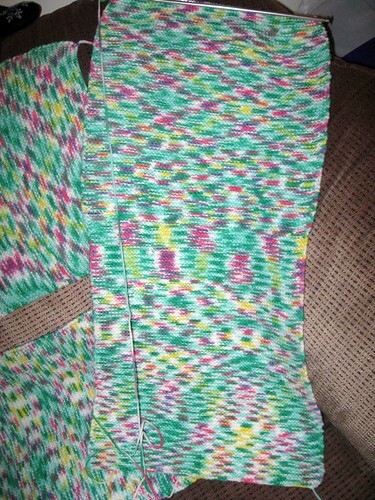 I think it would be too cool to knit my own scarves and sweaters! I need someone to teach me! Sandra: Sounds like you should pick up some yarn to test out the old crocheting skills. Then if you can do it we can swap teaching each other. Heck we can do a girls weekend away!!!! Hey a girl can dream can’t she? 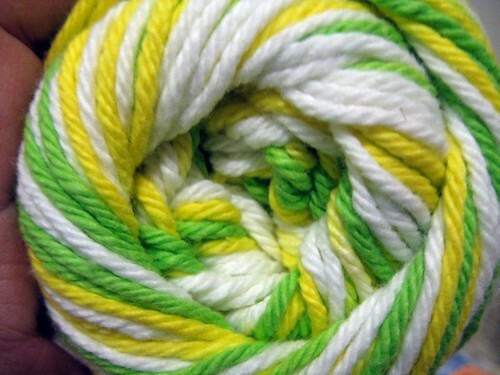 I actually just bought that lemon lime yarn to make dish clothes with! I like it. I am just learning to knit. I am on my 3rd dish cloth and I knit a scarf for my little daughter. qtpies7: I guess I should confess. . . I actually suggested that one for my son since he likes green. However, the bright yellow in it has since blinded me. It just reminds me of my Mountain Dew Days from college. I do like it, but it is on the more shocking side compared to the others. Congrats on learning to knit and making the dish cloths. Any pattern recommendations would be greatly appreciated. I learned how to knit a few years ago…but since we had our first son I have to admit that my knitting skills have gone to the wayside! Oops! :) I just wanted to pop over and say thanks for entering my contest!! Good luck! You’ve been tagged on my blog! ;) Have fun! Andrea: Thanks for coming over to my blog. I completely understand not being able to knit much with little ones. I tend to do it at night when my 4 year old and 8 month old are asleep. You are going to be busy soon enough with another little one coming soon. Congrats and best wishes. Renee Thanks – all taken care of ;) Oh and your kiddos are gorgeous.